James G. Gimpel is a professor of government at the University of Maryland, College Park. He can be reached at jgimpel@gvpt.umd.edu. This Backgrounder examines the political implications of large-scale immigration. Between 1980 and 2008, 25.2 million people were granted permanent residency (green cards) by the United States. A comparison of voting patterns in presidential elections across counties over the last three decades shows that large-scale immigration has caused a steady drop in presidential Republican vote shares throughout the country. Once politically marginal counties are now safely Democratic due to the propensity of immigrants, especially Latinos, to identify and vote Democratic. The partisan impact of immigration is relatively uniform throughout the country, even though local Republican parties have taken different positions on illegal immigration. Although high immigration may work against Democratic policy goals, such as raising wages for the poor and protecting the environment, it does improve Democratic electoral prospects. In contrast, immigration may help Republican business interests hold down wages, but it also undermines the party’s political fortunes. Future levels of immigration are likely to be a key determinant of Republicans’ political prospects moving forward. The electoral impact of immigration has been greatest in counties with large populations, where most immigrants settle. In these locations, Republicans have lost 0.58 percentage points in presidential elections for every one percentage-point increase in the size of the local immigrant population. On average the immigrant share has increased 9.5 percent in these counties. In counties of at least 50,000, where the immigrant share increased by at least two percentage points from 1980 to 2008, 62 percent saw a decline in the Republican percentage. In counties with at least a four percentage-point increase, 74 percent saw a decline in the GOP vote. In counties with at least a six percentage-point gain in the immigrant share, 83 percent saw a decline in the GOP vote share. Republicans have remained competitive in presidential elections because losses in high-immigration counties have been offset by steady gains in low-immigration counties. Even in Texas and Florida, often thought to be an exception, the rising immigrant population across counties is associated with sharply diminished support for Republican candidates. In Texas, for example, the estimate shows that for every one percentage-point increase in the immigrant population in a county, the Republican vote share dropped by 0.67 percentage points, which is more than the decline nationally association with immigration. The decline does not seem to be associated with the local Republican Party’s position on illegal immigration. How has the growth of the immigrant population changed the political partisan leanings of the places where immigrants have settled? The answer to this question is of considerable interest to academic specialists, journalists, interest groups, and political parties engaged in the immigration policy debate. If the impact of mass immigration is politically neutral, there is no reason to be concerned that constituencies will change appreciably by the settlement and naturalization of new arrivals. In that case, immigration might have economic and cultural impacts that should be anticipated, but no one need be concerned about political shifts. On the other hand, if immigration does change the politics of locales, districts, and even entire states, then what might those changes entail? Certainly one important implication will be a resultant public shift toward favoring governmental activism — a belief that government should do more, rather than less. Latino voters, for instance, are presently among the demographic groups that are most strongly behind an activist government. This is undoubtedly because they have, on balance, lower incomes, and concentrate in areas monopolized by Democratic Party politics into which they are easily socialized. Observers have witnessed the concurrent surge in California’s immigrant population, fueled mostly by the relocation of less-educated Mexicans, along with its rising Democratic Party majority, especially in presidential elections.1 Recent studies of Latino party identification have shown that those of Mexican origin, and occupying the lower rungs of the socioeconomic ladder, are especially likely to identify with the Democratic Party (Alvarez and Garcia-Bedolla 2003, 40). Remarkably, Latinos in California appear to vote overwhelming Democratic even when Republican Latino candidates are on the ballot opposing Anglo Democrats (Michelson 2005). It is not surprising, then, that the nation’s sustained flow of lower-skilled immigrants, largely from Latin America, has given rise to predictions of an emerging Democratic Party majority by a variety of studious onlookers (Judis and Texiera 2002; Campbell 2008; Arnoldy 2008; Lopez and Taylor 2009). After all, the propensity for immigrants, and especially Latinos, to be swing voters has been wildly exaggerated by wishful-thinking Republican politicians and business-seeking pollsters who refuse to acknowledge the durability of individual party identification (Green, Palmquist, and Schickler 2002). Nevertheless, the rise in Democratic Party prospects in California and elsewhere has more than a single source, and it is always questionable just how much this partisan realignment can be attributed to immigration. In most locations in the United States, the most direct instrument for the political influence of immigrants is the naturalization process, by which immigrants become citizens and can then vote. It is well known that not all immigrants naturalize as soon as they are eligible.2 The longer an immigrant resides in the United States, however, the more likely he or she is to naturalize. Moreover, according to recent reports the share of eligible immigrants choosing to naturalize reached a 25-year peak of 59 percent in 2005, up from just 48 percent in 1995 (Passel 2007). Estimates of annual naturalizations were running about 650,000 per year as of mid-decade, with about 35 percent of the present foreign-born population now naturalized and eligible to vote. The rate of naturalization for Mexicans, by far the single largest immigrant nationality group, has also increased, though it is still lower than other immigrant groups, at around 35 percent of the eligible Mexican immigrant population (Passel 2007). Origins matter, as the naturalization rate from Latin America is lower than from other regions of the world. About 4.4 million immigrants from Latin America are naturalized (46 percent of those eligible), compared with four million from Asian nations (71 percent), 2.8 million from Europe and Canada (69 percent), and 444,000 from Africa and the rest of the world (59 percent) (Passel 2007).3 Although Latino immigrants have the lowest naturalization rate, their sheer numbers make them a potentially influential population, casting about 7.4 percent of all votes in national elections (Lopez and Taylor 2009; Lopez 2008). Notably, more recent immigrant entry cohorts also show themselves to be naturalizing faster than did previous cohorts (Passel 2007, 16). Related research has shown increasing levels of political mobilization among naturalized immigrants, at least in some key states (Barreto 2005). With rising immigration, and faster naturalization rates, the potential for immigrants to exert direct political influence is higher than it has been in the past. But for this influence to register, immigrants must have decidedly different political viewpoints and preferences than the native-born. If immigrants possess or come to acquire the same partisan predispositions as natives and divide their votes in the same way, there is not likely to be much political change resulting from their emergence into the electorate. But recent studies have indicated that the foreign-born, and particularly the large Latino immigrant populations, do not mimic the attitudinal and behavioral tendencies of natives. They have slightly lower participation rates, and they are far more Democratic in their party identification and vote preference. Throughout the last decade, for instance, surveys large enough to represent the foreign-born population eligible to vote all showed a lopsided preference for the Democratic Party. 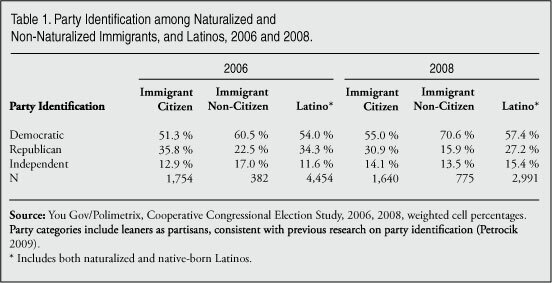 The 2008 Cooperative Congressional Election Study, conducted by YouGov/Polimetrix, gauged the partisan preferences of over 1,700 naturalized immigrants and found 55 percent to be Democratic identifiers, 31 percent Republican, and 14 percent independent (see Table 1).4 The 2004 National Annenberg Election Study found a similar percentage of naturalized citizens to be allied with the Democratic Party: 49 percent, compared to just 32 percent for Republicans and 19 percent for independents (n=4,138). In non-presidential years, the Democratic bias appears to drop due to the considerably smaller electorate casting ballots in mid-term contests. The YouGov/Polimetrix survey in 2006 exhibited less Democratic bias among immigrants eligible to vote, at 51 percent, compared with 36 percent Republican identifiers and 13 percent independent (Table 1). In both the 2006 and 2008 surveys, however, the independents actually leaned lopsidedly Democratic, and voted that way in the November general election. Democratic senators, for instance, captured 64 percent of the immigrant vote actually cast in 2006, compared with just 34 percent won by the GOP candidates. This favoritism of the Democrats in mid-term contests is especially pronounced in closely competitive elections, as previous research on the Latino electorate has shown (Gimpel 2007; Gimpel 2003). Republicans do well in mid-term contests among immigrants only in cases where immigrant turnout drops and/or the GOP candidate is an overwhelming favorite, bringing only the most Republican-identifying immigrant voters to the polls. More importantly, among immigrants who are not yet citizens, these same surveys show an even greater preference for the Democratic Party (Table 1). With the Democratic bias in immigrant political preference so decisive and so predictable, it is no surprise that the rise in immigrant populations should directly lead to ever-growing Democratic majorities in the places where immigrants settle, and declining electoral prospects for Republicans. The instrument of this partisan realignment is the directly observable behavior of the immigrants themselves. Even when immigrants are slow to naturalize and vote, however, the instrument of political realignment at the local level can lie in the indirect force of population displacement. If particular populations are pushed out of areas as a consequence of large-scale immigrant flows, this could have the impact of altering the political complexion of districts, states, and regions. A number of labor economists, economic historians, and demographers have documented the prodigious outflow of natives associated with immigrant influx (Frey 1996; Frey and Liaw 1998; Frey, Liaw, Xie, and Carlson 1996; Borjas 1999, Chap 4; Hatton and Williamson 2006, Chap. 14). The exodus is a consequence of downward pressure on wages coupled with rising housing prices, costs that natives would rather avoid by moving elsewhere. These “crowding out” effects are noticeable only when the volume of immigration is large and one can observe the native response across numerous internal labor markets. For the native out-migration to have a politically realigning effect on the location left behind, the existing voters have to be predominantly identified with one particular political party. Demographic studies of interregional migration during the 1980s and 1990s suggested that, with the exception of elderly migration flows to a few locations, internal migrants were predominantly white, younger, lower middle and middle class, and upwardly mobile. Early evidence from several studies indicated the presence of an independent political leaning among migrants at least following the move (Brown 1988), with some Republican bias to movers in general (Gimpel and Schuknecht 2001). If internal migration exhibits a Republican bias, and the volume of outflow is sufficiently high, then an ever-greater Democratic majority at the locations left behind — among the non-migrants — would be the outcome. Immigrants, under these circumstances, need not naturalize and vote in order to generate significant electoral change in states, districts, and localities. A third possible mechanism for electoral change is that the arrival of immigrants in a location produces larger political majorities because, under population pressure, natives hasten to align themselves with the dominant political organization in these locales. This would occur, for instance, if natives anticipated that the only modicum of competition would be within the dominant party anyway, so there was no point in aligning with the minority party. In most cases, the destinations that immigrants initially aimed for as their inflow intensified in the 1970s already had decided local Democratic majorities. The minority party was not a sufficiently credible local presence in these cities to position itself to take advantage of native disaffection with the results of population pressure. Under such circumstances, political control over the dominant party apparatus in local politics can be settled only within ever more contested primaries often pitting racial and ethnic groups against one another (Kaufmann 2004). But once the primary is over, the general election outcome is then settled. The main difference between the old politics and the new is in the crowdedness of primaries, and the diversity of groups vying for control. This scenario may fit the experience of large numbers of U.S. cities where the Republican Party is rarely a competitive force, but Democratic Party politics have become increasingly divisive as the white share of the urban electorate has declined. Especially in those cities that have not seen appreciable out-migration by natives, but have seen growth from international sources, it makes sense that the explanation for increasing Democratic electoral majorities lies in the native calculation that fighting within Democratic ranks makes better sense than converting to the hopelessly overmatched Republicans. After all, there was little chance that the new immigrant arrivals would elect their own officeholders anytime soon, as that kind of upward political progress would take a generation or more. By this logic, then, natives became a larger share of the Democratic electorate, but immigrants did as well. Both contributed, and are contributing, to the extinction of urban (and increasingly suburban) Republicans as the immigrant population expands its presence outward from its original central-city destinations (Frey 2006). Given that the immigrant population is drawn to the nation’s largest cities, it is instructive to take a brief look at the 25 largest U.S. counties for selected election years (see Table 2).6 A very large share of the total population in these 25 counties was foreign-born by 2008 — around 26 percent on average. This compares to just 12 percent in 1980, showing that the immigrant population has become a far larger presence in these locales, even though it may be diffusing outward from the central cities in these same counties (e.g., Los Angeles (Los Angeles), Cook County (Chicago)) to their suburbs. By 2008, nearly half (47 percent) of the nation’s total foreign-born population was estimated to live in these 25 counties, compared with just 21 percent of the native-born population. 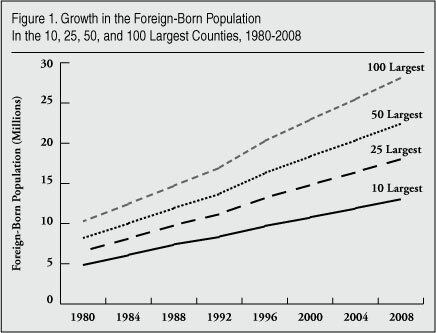 This figure for foreign-born concentration has not changed much since 1980 (46.4 percent); however, it is proof that the growing immigrant population has remained highly concentrated in the largest urbanized counties, even though there have been some streams moving into outlying areas. The vast majority of the foreign-born in these counties, as in the nation as a whole, are of Latino ancestry as they have been over the last 30 years. Our central question is whether the rising tide of immigration in the nation’s counties, large and small, has altered their political character. We can certainly see suggestive evidence in support of this notion. Republican presidential voting has declined notably since 1980 in all of the counties in Table 2, and this is not due simply to the differing candidacies (Reagan vs. Bush vs. McCain). To be sure, immigration trends are not the only place to look for an explanation. The smallest losses in GOP support have been in Texas, the largest in California, and yet the immigrant (predominantly Latino) percentage of the population has risen in both. There is also evidence of a drop in GOP support in locations where the immigrant population has not jumped dramatically, such as Cleveland (Cuyahoga County, Ohio) and Detroit (Wayne County, Mich.). Important facts such as these remind us that a rising immigrant voting population is not the only possible source of declining Republican prospects in large counties. The flight of natives from these counties and the growing concentration of native-born African Americans may also contribute to the enlargement of local Democratic majorities. Even so, the rise in the number of immigrants flowing into the nation’s largest counties has to account for some of the partisan change. Figure 1 indicates that the growth has been in the neighborhood of 171 percent for the 100 largest counties in the nation since 1980, even though the native-born population increase in these counties collectively has been a modest 17 percent. And even if only around 38–40 percent of the foreign-born are naturalized and eligible to vote in any given election, their rapid numeric increase coupled with their Democratic alignment seems certain to be a major source of declining GOP electoral prospects. 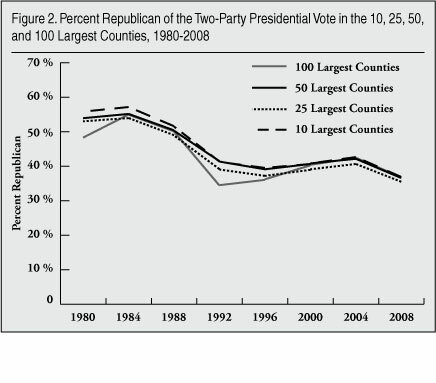 The declining Republican percentage of the two-party presidential vote in the largest counties is exhibited in Figure 2. The drop in support for Republicans is both steady and sharp. In 1980 the largest counties, in the aggregate, gave about half of their two-party vote to the Republicans (ranging from 56 percent for the 10 largest counties, to 48 percent in the 100 largest). The upshot is that these locations, which contain a mixture of central cities and suburbs, were marginal and contested 25–30 years ago, ensconced in the middling deciles of Reagan support in 1980. By 2008, however, the Republican two-party vote percentages at these locales hovered between 35 and 37 percent — in some cases a 20 percentage-point drop across the intervening election cycles (see Figure 2). By the new century, these counties were collectively no longer marginal, but instead safely Democratic. Specific locations where the immigrant population appears to have had a direct impact in diminishing GOP prospects include all of the larger California counties, as well as Maricopa County, Ariz. (Phoenix); Kings County, N.Y. (Brooklyn); Dallas, Texas (Dallas); and Miami-Dade, Fla. (Miami). All of these locations would be considerably more competitive were it not for the triple-digit growth in the foreign-born proportion of their local populations. To produce a summary estimate of the impact the surging immigrant population had on Republican vote share in the nation’s 100 largest counties, the data for eight elections were combined into a single, pooled, cross-sectional data file (100x8=800 observations total). About 37 percent of votes cast in the 2008 presidential election were cast in these 100 locations, as they were home to 34 percent of the total U.S. population. The results indicate that a one percentage-point increase in the share of immigrants across these large counties produced an average 0.58 percentage-point drop in the Republican percentage of the vote, controlling only for election year. Realizing that the vote may also be influenced by other socioeconomic dynamics, we included controls for the median household income and the percentage of African American residents in these counties (see Table 3). The impact of the increasing immigrant presence was actually slightly augmented by these changes: A one-point increase in the percentage of immigrants dropped the Republican percentage of the vote by 0.59 percentage points, a very precipitous decline (see Table 3). Another way to gauge the impact is to evaluate the effect of a one standard deviation increase in the immigrant population because a single standard deviation is a considered a fairly typical degree of change in the distribution. This calculation shows that a one standard deviation (σ=9.9) increase in the percentage of immigrants in the local population drops the GOP vote share by a marked 5.8 percentage points. In short, the rise in the immigrant, and particularly the Latino, population has been a powerful force behind the decline in the share of the Republican vote in these urban and suburban centers of electoral power. When we incorporate the nation’s remaining counties, the immigrant population is likely to be a lesser force driving political change and our estimates of impact are likely to diminish. This is because immigrant populations have been slow to settle outside of major metropolitan areas, so any surge in Democratic voting must be attributable to other causes. The results summarized in the right side of Table 3 indicate that a 1 percent increase in the immigrant population across these eight election cycles, generates a 0.38 percentage-point drop in the Republican vote share, a substantial effect. 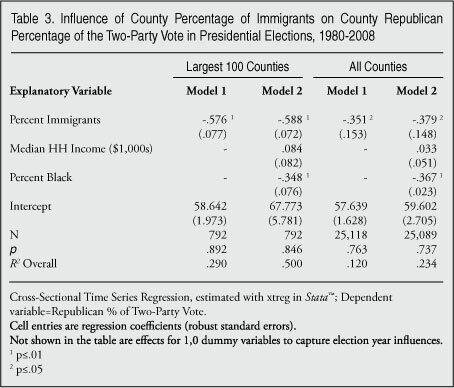 Calculations indicate that a single standard deviation (σ=4.4) increase in the proportion of immigrants drops the Republican vote share by an average of 1.7 percentage points, even after we control for the independent impact of election year, median household income, and the percentage of black residents. States such as California and New York have lost their competitive status in presidential elections as a consequence of such fundamental demographic change. Florida has moved from a safely Republican state to a perpetual battleground. Texas, too, sits on the threshold of more competitive politics as Democrats steadily gain ground in Dallas, Houston, and the state’s other large cities. What is quite remarkable is that even when we consider Texas alone we find that, as the immigrant population has grown across its 254 counties, the Republican vote share has declined from where it stood 30 years ago. Estimates for California and Texas appear in Table 4. For Texas, the estimate shows that for every 1 percent increase in the immigrant presence in a county, the Republican vote share dropped by 0.67 percentage points, which is considerably higher than the impact nationally. 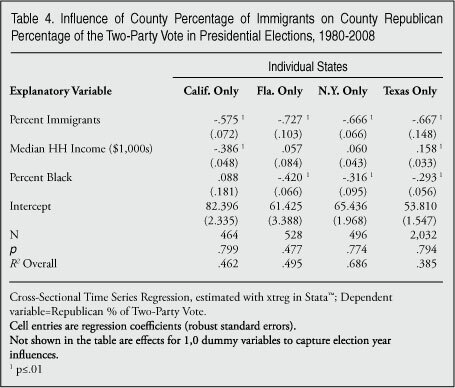 A one standard deviation (σ=6.07) increase in the percentage of immigrants taking up residence in Texas counties, translates into a four percentage-point drop in Republican Party prospects, controlling for income and the percentage of black residents. Contrary to conventional wisdom, immigration is precisely why the GOP has lost so much ground in the most heavily Latino areas of South Texas, as well as in the larger urban counties. The story is somewhat different for California. Yes, the drop in Republican presidential voting has followed on the heels of the immigrant influx; a 1 percent increase in the immigrant concentration drops the GOP vote share by about 0.58 percentage points (σ=9.21 producing a 5.3 percentage-point decrease for Republicans with a single standard deviation increase in the immigrant presence). But rising incomes decrease the GOP vote share as well, as the wealthy coastal counties have become profoundly Democratic since the Reagan years. In Texas, rising affluence is a countervailing force, bolstering Republican performance at the county level. In California, however, immigration and growing affluence have combined to put the state out of Republican political reach in national elections. According to our estimates in Table 4, a single standard deviation (σ=8.1) increase in the share of immigrants in New York’s counties from 1980 to 2008 decreased the Republican vote share in presidential elections by 7.3 percentage points, a remarkably steep drop reflecting the declining performance of New York City area counties for the GOP for major offices. In fact, viewing New York from the perspective of the 2004 and 2008 presidential elections, it is hard to believe that Republicans once populated the New York City boroughs at all, electing such prominent local officials as Theodore Roosevelt, Fiorello LaGuardia, Jacob Javits, and Bill Green. This tradition has largely disappeared — and the current New York City council counts just five Republicans among its 51 members. In the state legislature, Republican representation from the New York City boroughs and suburban counties has dwindled. And although Republicans have won the mayoralty of New York City, many party officials in the rest of the nation wonder if the issue positions a candidate must take to win the mayoralty are compatible with Republican Party principles. As for Florida, immigration has also steered this once solid Republican state in an increasingly Democratic direction. This was not always the case, of course, as the earliest waves of Cuban immigrants greatly bolstered Republican prospects in South Florida. Dade County was once winnable by Republicans, as it awarded Ronald Reagan 56 percent of the two-party vote in 1980. In 2008, John McCain won just 42 percent of the two-party vote in Dade County, which cast nearly twice as many votes as it had in 1980. Next door, Broward County was a safe Republican jurisdiction a generation ago. Broward had moved resolutely into the Democratic camp by the turn of the new century, though this development was also facilitated by the retirement migration of elderly Democrats from the Northeast. The old exile politics that helped hawkish Republicans win in South Florida has faded, and the immigration flows have been decidedly less Cuban in origin with time. 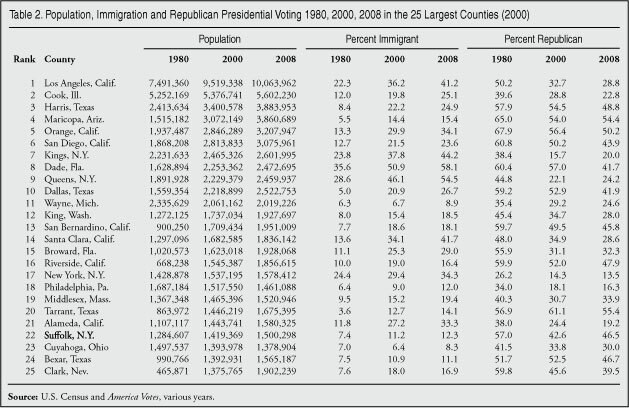 This is why the estimates in Table 4 show that a single standard deviation (σ=4.9) increase in immigration between 1980 and 2008 winds up decreasing the Republican vote share by 3.6 percentage points — not as drastic as the effect on New York State, but certainly enough to move Dade, Broward, and other high-immigration counties decidedly toward the Democrats in presidential elections. Using standard statistical methods, this research has directly estimated the impact of the rising percentage of immigrants across U.S. counties on Republican presidential voting in the eight presidential elections from 1980 to 2008. The conclusion is inescapable and uncomplicated. As the immigrant population has grown, Republican electoral prospects have dimmed, even after controlling for alternative explanations of GOP performance. A typical drop in Republican support in a large metro area county is about six percentage points. In other words, an urban county that cast 49 percent of its vote for the Republican candidate in 1980 could be expected to drop to 43 percent by 2008. Across all U.S. counties, including many rural counties, the estimated effect of immigration is to drop Republican vote share 1.7 to two percentage points. Even in seemingly remote locations with negligible immigrant populations, the effect is sufficient to move a 51 percent county to a 49 percent county. Aggregated over the large number of counties and viewed through the template of the Electoral College’s winner-take-all system of elections, the impact of immigration is easily sufficient, by itself, to decide many current and future presidential elections. If we take two roughly comparable elections, 1988 and 2004, as bookends and examine the counties with more than 50,000 people (2004)7 that experienced just a two percentage-point gain or more in the share of the population that is foreign-born, 62 percent of those locations also saw a drop in their Republican vote share between those two contests. Inspecting figures for those counties experiencing a 4 percent or greater gain in the percentage of the population that is foreign-born, 74 percent of those counties witnessed a drop in Republican vote share. Given a 6 percent gain or more in the immigrant share of the population from 1988 to 2004, 83 percent of those counties lost GOP vote share. These comparisons plainly amplify the point that growing immigrant populations have eroded Republican electoral prospects in the vast majority of cities and towns of substantial size. Ironically, past Republican votes in Congress in favor of a more generous immigration policy have unquestionably bolstered local Democratic majorities, and succeeded in stamping out Republican prospects in once politically competitive locales. This is because Republicans have not converted the legions of Democratic-leaning Latinos who constitute the lion’s share of the immigrant population. Nor can they be expected to win over many Latinos given their weak institutional presence in the locations where new arrivals typically settle. The hope for Republican success with immigrant voters lies mainly with the upward mobility and prosperity of Latinos, Asians, and others, something that will occur only with great difficulty given current levels of low-skill, wage-corrosive immigration. Republicans are right to want to attract Latino voters. They are indisputably a growing share of the population and the electorate. But expanding the future flow of low-skilled immigrants into an economy ill-suited to promote their upward mobility will clearly be counterproductive given the evidence presented here. At the same time, Republican opposition to higher immigration levels can be too easily typecast as racist and xenophobic. This is because the party’s elites have failed to deliver a clear message that they want a pro-immigrant policy of reduced immigration and that these two goals are complementary. Such a policy would also prove to be the best means for moving immigrants toward the middle and upper income status that will promote their geographic and political mobility. Alvarez, R. Michael and Lisa Garcia-Bedolla. 2003. “The Foundations of Latino Partisanship: Evidence from the 2000 Election.” Journal of Politics 65: 31-49. Arnoldy, Ben. 2008. “The Mountain West, Once GOP Turf, is Now Competitive.” Christian Science Monitor. January 31, p. 2. Barreto, Matt A. 2005. “Latino Immigrants at the Polls: Foreign-born Voter Turnout in the 2002 Election.” Political Research Quarterly 58: 1: 79-96. Borjas, George J. 1999. Heaven’s Door: Immigration Policy and the American Economy. Princeton, NJ: Princeton University Press. Brown, Thad A. 1988. Migration and Politics: The Impact of Population Mobility on American Voting Behavior. Chapel Hill: University of North Carolina Press. Campbell, Don. 2008. “Why Ga. should be on GOP’s mind; Tour Atlanta’s suburbs to get a sense of where this country is headed. The minority population is booming, and the math is decidedly against the GOP.” USA Today. November 18, pg. 11A. Frey, William H. 1996. “Immigration, Domestic Migration and Demographic Balkanization in America: New Evidence for the 1990s.” Population and Development Review 22: 4: 741-763. Frey, William H. 2006. “Diversity Spreads Out: Metropolitan Shifts in Hispanic, Asian and Black Populations since 2000.” Brookings Census 2000 Series. Washington, DC: Brookings Institution Metropolitan Policy Program. Frey, William H., Kao-Lee Liaw, Yu Xie and Marcia J. Carlson. 1996. “Interstate Migration of the U.S. Poverty Population: Immigration “pushes” and welfare magnet “pulls.” Population and Environment 17: 6: 491-533. Frey, William H. and Kao-Lee Liaw. 1998. “Immigrant Concentration and Domestic Migrant Dispersal: Is Movement to Nonmetropolitan Areas ‘White Flight’? Professional Geographer 50: 2: 215-232. Gimpel, James G. 2003. “Latinos and the 2002 Election: Republicans do well when Latinos Stay Home.” Washington, DC: Center for Immigration Studies Backgrounder, January. Gimpel, James G. 2007. “Latino Voting in the 2006 Election: Realignment to the GOP Remains Distant.” Washington, DC: Center for Immigration Studies Backgrounder, March. Gimpel, James G. and Jason E. Schuknecht 2001. “Interstate Migration and Electoral Politics.” Journal of Politics 63: 1: 207-231. Green, Donald P. Bradley Palmquist and Eric Schickler. 2002. Partisan Hearts and Minds: Political Parties and the Social Identities of Voters. New Haven: Yale University Press. Hatton, Timothy J. and Jeffrey G. Williamson. 2006. Global Migration and the World Economy: Two Centuries of Policy and Performance. Cambridge, MA: The MIT Press. Judis, John B. and Ruy Teixeira. 2002. The Emerging Democratic Majority. New York: Simon and Schuster. Kaufmann, Karen M. 2004. The Urban Voter: Group Conflict and Mayoral Voting Behavior in American Cities. Ann Arbor: University of Michigan Press. King, Gary. 1997. A Solution to the Ecological Inference Problem: Reconstructing Individual Behavior from Aggregate Data. Princeton, NJ: Princeton University Press. Larsen, Luke J. 2004. “The Foreign-Born Population in the United States: 2003.” P20-551. Washington, DC: U.S. Department of Commerce, U.S. Census Bureau. August. Lopez, Mark Hugo. 2008. “The Hispanic Vote in the 2008 Election.” Washington, DC: Pew Research Center. http://pewhispanic.org/reports/report.php?ReportID=98, accessed January 4, 2010. Lopez, Mark Hugo and Paul Taylor. 2009. “Dissecting the 2008 Electorate: Most Diverse in U.S. History.” Washington, DC: Pew Research Center. http://pewhispanic.org/files/reports/108.pdf, accessed January 4, 2010. Michelson, Melissa. 2005. “Does Ethnicity Trump Party? Competing Vote Cues and Latino Voting Behavior.” Journal of Political Marketing. 4: 4: 1-26. Passel, Jeffrey S. 2007. “Growing Share of Immigrants Choosing Naturalization.” Washington, DC: Pew Research Center. http://pewhispanic.org/reports/report.php?ReportID=74, accessed January 4, 2010. Petrocik, John R. 2009. “Measuring Party Support: Leaners are not Independents.” Electoral Studies. 28: 4: 562-572. Wong, Janelle S. 2000. “The Effects of Age and Political Exposure on the Development of Party Identification among Asian American and Latino Immigrants in the United States.” Political Behavior 22: 4: 341-371. 1 California has not been in play politically since 1988, when George H.W. Bush won a narrow 51.1 percent victory over Michael Dukakis. 2 Eligibility requires: reaching the age of 18, living continuously in the United States for five years, acquiring some basic knowledge of English and U.S. government, successfully passing a background check for criminal history, taking the oath of citizenship, and swearing allegiance to the United States. 3 For comparison: Barack Obama’s margin of victory over John McCain was 9.5 million votes nationwide; 3.3 million in California alone; two million in New York. In other words, just two large immigrant-receiving states accounted for 55 percent of President Obama’s margin of victory. 4 Party registration was similarly divided; 48 percent Democratic, but 27 percent Republican. 5 Readers should be mindful of the fact that county boundaries are arbitrarily drawn, giving rise to issues of ecological inference; one cannot infer the behavior of individual citizens from observing the aggregate units (King 1997). But in this particular research, we are interested less in the behavior of individuals than in how locations or places have changed, making these locations either more or less receptive to the appeals of particular political interests. We draw upon county level data from 1980 to 2008, using interpolated estimates where necessary to capture the intercensal years. 6 Data for all counties are available from the author upon request. 7 These counties were home to an estimated 86 percent of the U.S. population, and an estimated 97 percent of the foreign-born population in 2004.